I’m delighted to be a part of this programme, and will be visiting Gelsenkirchen more frequently in 2015. My classes are generally held at the Grillo Gymnasium in the city centre, and are intended to help those who may not be able to attend regular piano lessons. We work for a period of two days and all workshops are public. Each student receives one to one coaching (in English) and also has the opportunity to use the practise facilities at the school. The lessons are followed by a concert at the end of the weekend, where we all perform (including me!) and introduce our pieces. A variety of ages and abilities were invited to participate, and the improvement after a couple of days of intensive lessons was considerable. 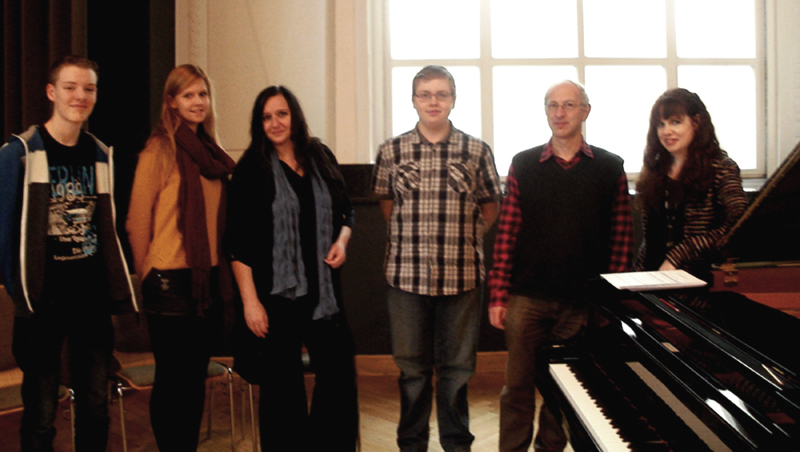 Students presented a wide range of works from Bach and Chopin, through to Denes Agay and Housman. An open class affords the opportunity to learn from others; whether a relative beginner or advanced player, there is always more to assimilate. It’s a pleasure to work with such attentive and dedicated pupils, and I look forward to many more German weekends. With Kery Felske (in the middle) and some of the students.